When the site for Washington D.C. was chosen to be the national capital of the United States, it was an undeveloped area. 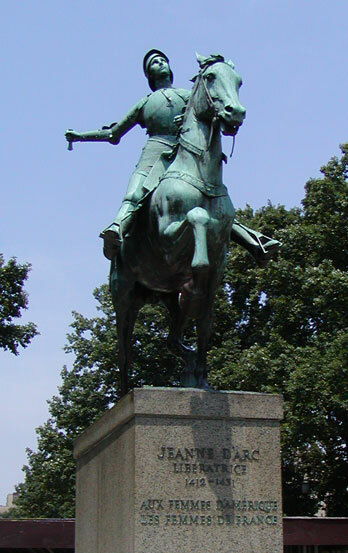 George Washington selected Pierre L'enfant to design the layout of the city. 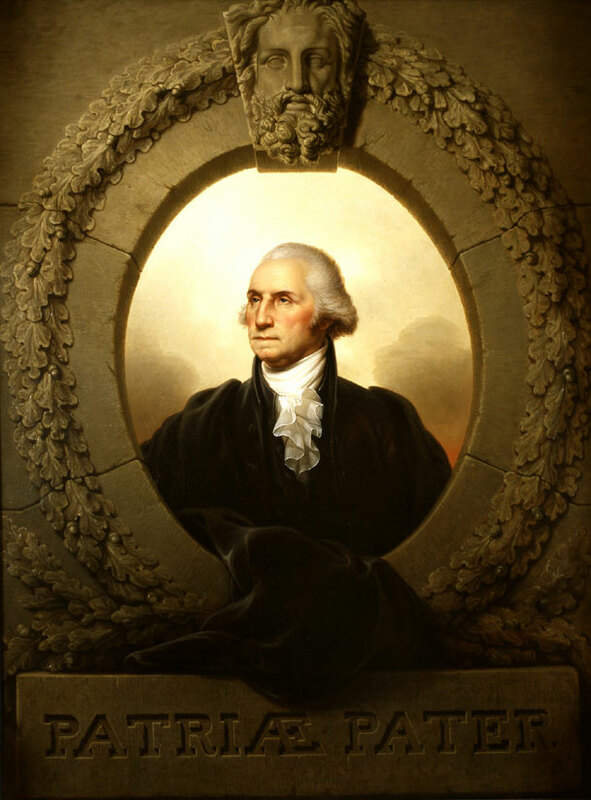 George Washington was the highest ranking member of the Masons at the time and the Masons were ardent students of ancient civilizations such as those of the ancient Egyptians and Greeks. 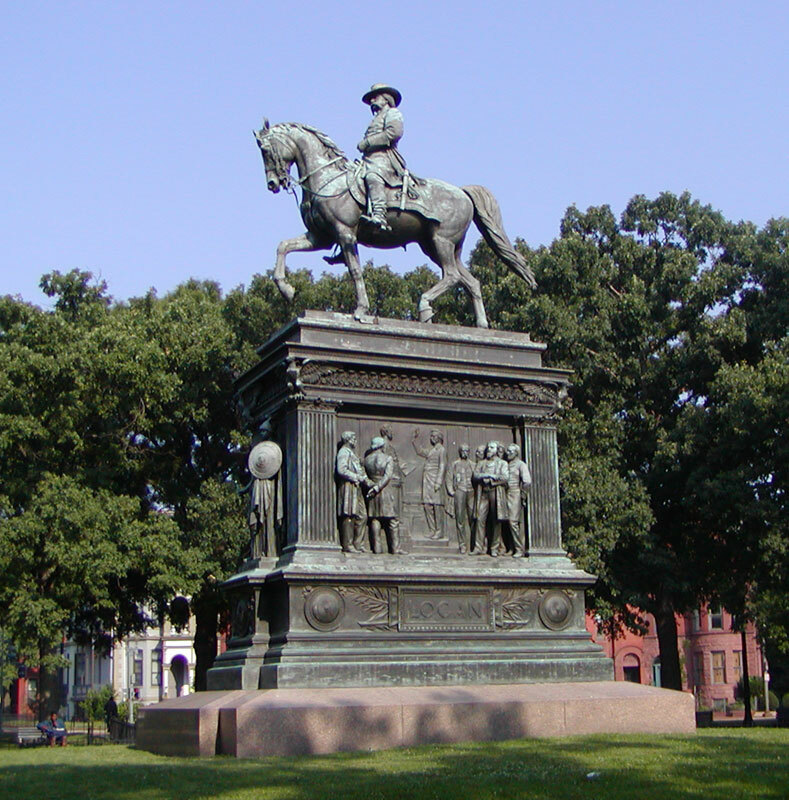 This is evidenced by many of the monuments in and around the city. 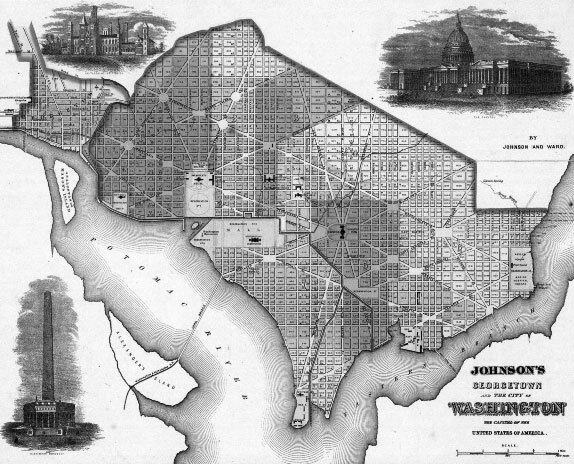 It has also been suggested that the streets, the broad diagonal avenues, and the blocks and circles left open for monumental structures, incorporated geometric designs of Masonic relevance, as shown in the 1862 map of Washington D.C. pictured below. The island known today as Roosevelt Island (due west of the White House in the middle of the Potomac) was called Mason's Island until early in the 20th century. George Mason originally owned the island and he built a bridge from the Virginia side. He had a large retreat house on the island where he entertained friends and guests. George Washington was a neighbor and very good friend of George Mason. Mason was the author of the Virginia Bill of Rights, which became the U. S. Bill of Rights when it was added as the first ten amendments to the constitution of the U.S. 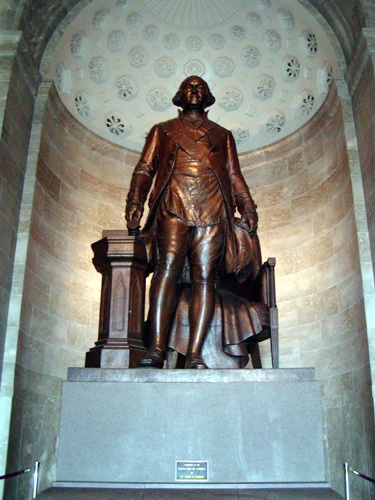 There is some evidence that George Mason was a Mason, but it is not certain. Extending New Hampshire Avenue to the southwest, into the Potomac, it crosses over the southern tip of Mason's Island. 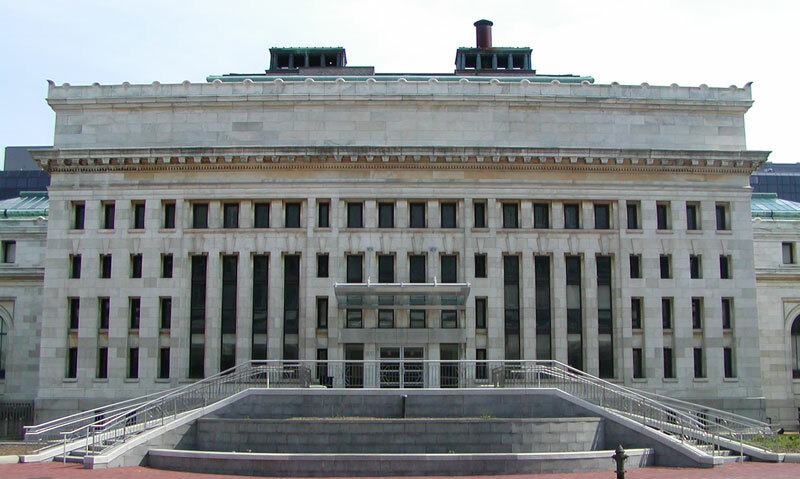 The Masonic Headquarters of the Scottish Rites of the 33rd degree is just south of the point where New Hampshire Avenue crosses 16th Street, due north of the White House. Highlighted below are Massachusetts and Connecticut Avenues radiating from the upper left circle, Rhode Island and Vermont Avenues radiating from the upper right circle, and the horizontal street is K street. 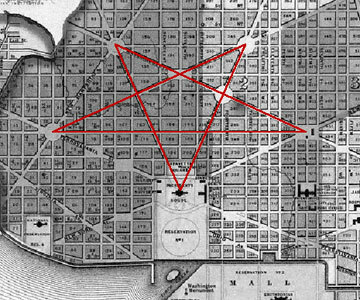 The White House is located at the apex of the pentagram. Highlighted below are Massachusetts Avenue and 19th Street radiating from the upper left circle, Rhode Island Avenue and 13th Street from the upper right circle, New York Avenue and 19th Street from the lower left square and Pennsylvania Avenue and 13th Street from the lower right square. The White House is located at the lower intersection point of the two large triangles that form the Hexagram. The pentagram and the hexagram are perfectly integrated with the White House in the layout of Washington D.C.
Below is a diagram of a pentagram drawn into a true hexagram. Each of the six lines that form the hexagram are three inches long and each of the short segments of the hexagram are one inch long. One is also the square root of one and three is the square root of nine. The distance between the adjacent outer points of the hexagram is 1.732 inches (AB, AC, BD, etc.) 1.732 is the square root of three. HD and all of the other segments that are comprised two of the short segments of the hexagram are two inches long. The distance HE is also two inches long. Two is the square root of four. The two diagonal lines of the pentagram (AE and BE) are 2.646 inches long. 2.646 is the square root of seven. The horizontal line of the pentagram (CD) is 3.464 inches long. 3.464 is the square root of 12. In the diagram below, points J and K from the diagram above are the centers and the segment JK is the radius of two circles, forming a vesica pisces that is perfectly inscribed by the four diagonal lines of the hexagram. The intersection point of the two circles (M) and the two intersection points of the hexagram diagramed below (N and O) form a triangle with angular dimensions nearly identical to the Great Pyramid of Giza. In the diagram below, a hexagram is drawn into a true pentagram. All five of the lines that form the pentagram are 1.618 inches long. The distance between all of the adjacent outer points of the pentagram, and all of the adjacent outer points of the hexagram, is one inch. The φ proportion is 1.618 to one. .7265 : .449 : .7265 ♦ .7265/.449 = 1.618 ♦ .7265 + .449 = 1.1755 ♦ 1.1755/.7265 also equals 1.618. All of the isosceles triangles in the hexagram have an apex angle of 72° and base angles of 54°. Bisecting these isosceles triangles forms 36° - 54° - 90° right triangles. This particular right triangle was an important geometric form known as the mr triangle in ancient Egypt. As shown in the diagram above, all six of the outer points of the hexagram are perfectly inscribed by a vesica pisces. 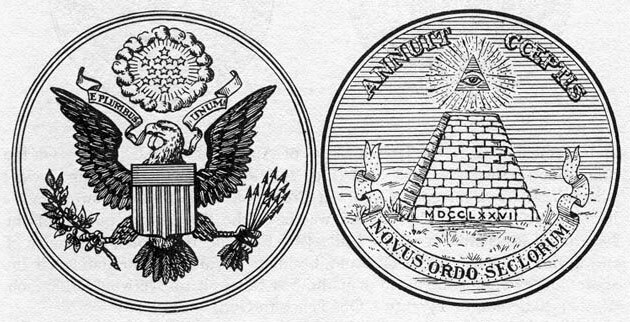 The pentagram and the hexagram are also combined in the Great Seal of the United States, displayed on the back of one dollar bills. The traditional explanation of the 13 stars is the same as the 13 arrows and the 13 leaves and berries on the olive branch, representing the 13 original states, but the arrangement of the 13 five pointed stars forms a hexagram. 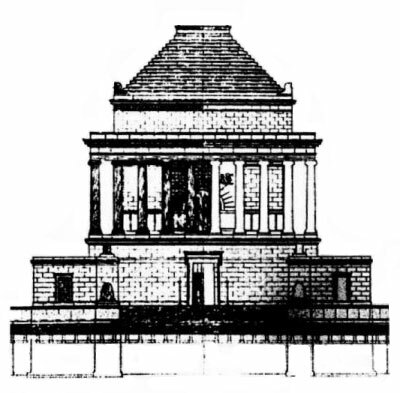 The truncated pyramid below the eye on the reverse side of the Great Seal is also comprised of 13 courses of masonry. 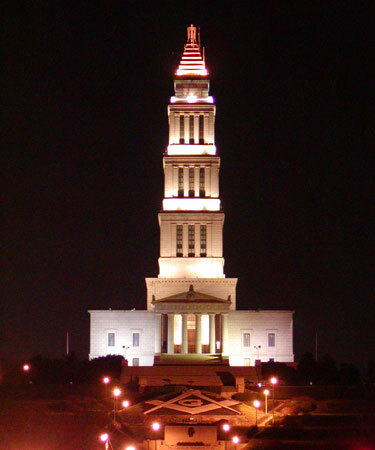 A 13 stepped truncated pyramid is also on top of the Masonic headquarters on 16th Street in Washington D.C. 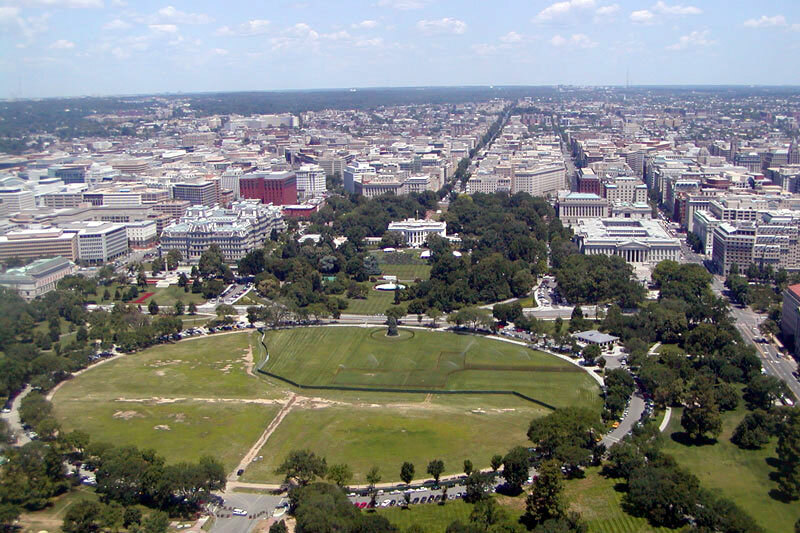 The boundaries of the District of Columbia, established by George Washington in 1791, formed a square with sides ten miles long, centered on the originally proposed location for the Washington Monument. The east-west diagonal of the square also crosses over the Capitol building and the north-south diagonal also crosses over the White House as well as the Masonic headquarters. The length of the north-south and east-west diagonals is ten miles times the square root of two, or 14.142 miles. This distance converts to 43,455 ancient Egyptian royal cubits, the same figure as the ratio between the Great Pyramid and the dimensions of the earth. The height of the Great Pyramid is 481.13 feet, divided by 5280 equals .0911231 miles. The mean radius of the earth is 3,960 miles, divided by .0911231 equals 43,457. The perimeter of the Great Pyramid is 3023 feet, divided by 5280 equals .5725 miles. The mean circumference of the earth is 24,880 miles, divided by .5725 = 43,458. Despite the fact that the United States has resisted the metric system since it's inception, a grid aligned to the cardinal directions, with lengths in even units of 900, 1200 and 1800 meters, provides a simple and accurate key to the location of the main buildings and monuments in the city and the slopes, angles and distances of the diagonal avenues. The north-south distance of zones 1-6 are each 900 meters. The east-west distance of zone A is 1800 meters. The east-west distance of zones B, C and D are each 1200 meters. The National Cathedral is at the north-west corner of zone 1A. 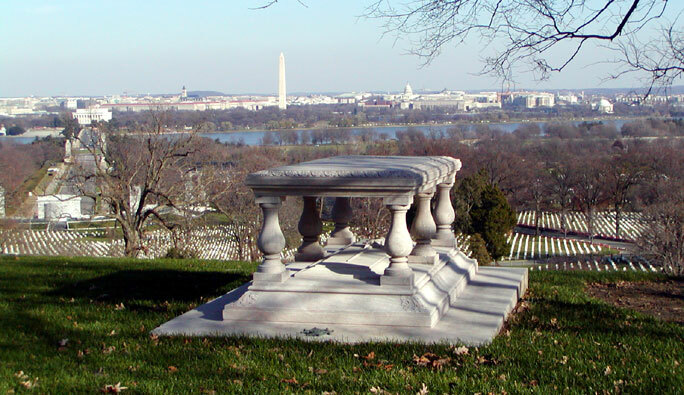 The Kennedy Memorial in Arlington Cemetery is at the south-west corner of zone 6A. The Lincoln Memorial is at the south-east corner of zone 5A. Washington Circle is on the eastern border of zone A.
Dupont Circle is in the center of zone 3B. 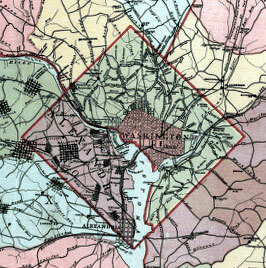 Logan Circle is in the center of zone 3C. 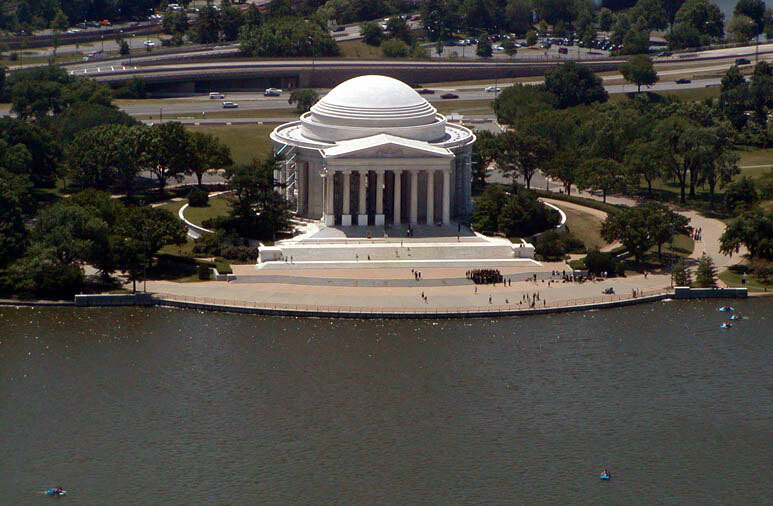 The Jefferson Memorial is at the south-east corner of 6B. The White House is at the south east corner of 4B. 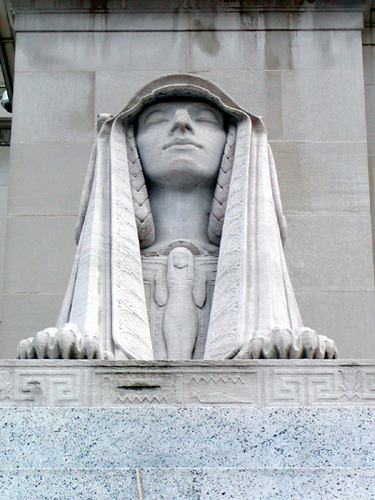 The Supreme Council of the Scottish Rite of Freemasonry is at the south-east corner of 2B. The western border of Meridian Park is on the eastern border of zone B. The Old Patent Office is at the south-east corner of zone 4C. L'enfant Plaza, the National Archive, The Naval Memorial and the City Museum are all on the eastern border of zone C.
The Capitol building is at the south-east corner of zone 5D. The Lincoln Memorial is 3600 meters west of the Capitol Building. The Jefferson Memorial is 1800 meters south of the White House (one-half of the distance from the Lincoln Memorial to the Capitol Building).. The White House is 900 meters north of the east-west axis of the Capitol Building. The Jefferson Memorial is 900 meters south of the east west axis of the Capitol Building. The Capitol Building is 2400 meters east of the north-south axis of the White House. The Lincoln Memorial is 1200 meters west of the north-south axis of the White House. The original plan for the city called for the Washington Monument to be located at the intersection of the north-south axis of the White House and the east-west axis of the Capitol building. It was later determined that the ground at this location was not stable enough to support the weight of the monument and it was ultimately constructed to the east and slightly to the south of it's originally intended location. The Supreme Council of the Scottish Rite of Freemasonry is 1800 meters north of the White House. 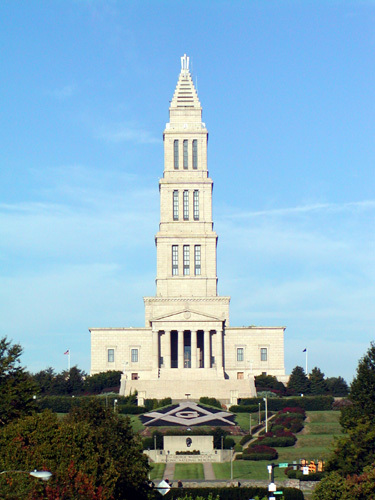 The Masonic Headquarters is 3600 meters north of the Jefferson Memorial, the same as the distance from the Lincoln Memorial to the Capitol Building. The Kennedy Memorial is 5400 meters south of the National Cathedral. The Kennedy Memorial is also 5400 meters west of the Capitol building. 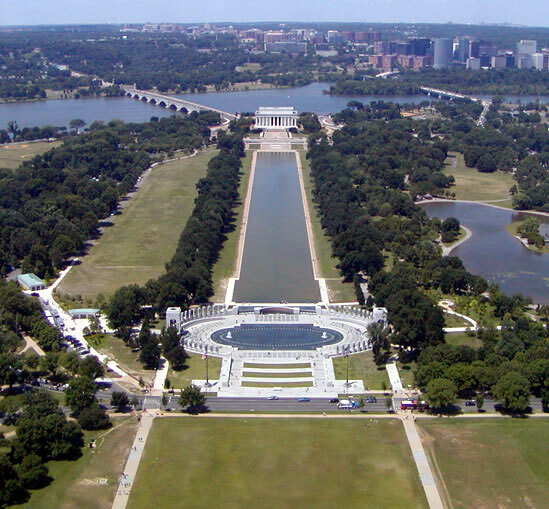 From the White House to the Capitol building, Pennsylvania Avenue travels 2400 meters east and 900 meters south. This slope of 24/9 reduces to 8/3, producing an angle of 20.556 degrees south of due east. Massachusetts Avenue travels from Dupont Circle in the center of zone 3B to the south-east corner of zone 4D, or 3000 meters east and 1350 meters south. This reduces to a slope of 20/9, producing an angle of 24.228 degrees south of due east. Rhode Island Avenue has the same slope and the same angle south of due west and north of due east from Logan Circle in the center of zone 3C. The City Museum is at the intersection of Massachusetts Avenue and the eastern border of zone C. From the center of zone 3B to the eastern border of zone C, Massachusetts Avenue travels1800 meters east. Given it's slope of 20/9, Massachusetts Avenue travels 810 meters south from the center of zone 3B to the eastern border of zone C. Since the center of zone 3B is 450 meters north of the southern border of zone 3, the City Museum is 360 meters south of the northern border of zone 4 (450 + 360 = 810). New York Avenue travels from the White House to the City Museum, or 1200 meters east and 540 meters north (900 - 360 = 540). This slope of 1200/540 also reduces to 20/9, producing the same angle of 24.228 north of due east. Due west of the City Museum, Washington Circle is 1200 meters west and 540 meters north of the White House, producing the same slope of 20/9 and the same angle of 24.228 degrees north of due west for Pennsylvania Avenue from the White House to Washington Circle. Dupont Circle is 600 meters west and 1350 meters north of the White House. Logan Circle is 600 meters east and 1350 meters north of the White House. In both cases the slope is 1350/600 or 9/4, producing an angle of 66.04 degrees north of due west for Connecticut Avenue from the White House to Dupont Circle and 66.04 degrees north of due east for Vermont Avenue from the White House to Logan Circle. 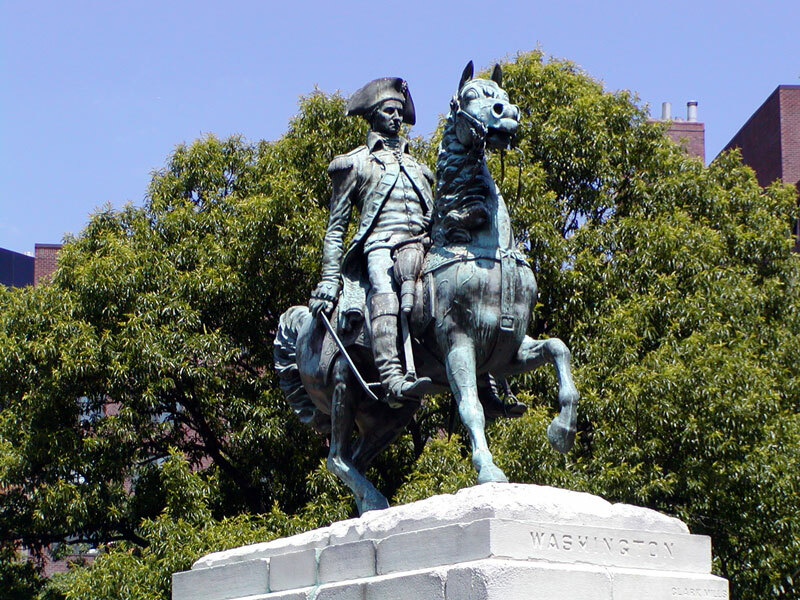 Washington Circle is 810 meters south and 600 meters west of Dupont Circle. This reduces to a slope of 9/6.66 repeating, producing an angle of 53.47 degrees north of due east for New Hampshire Avenue, from Washington Circle to Dupont Circle.. The axis of Memorial Bridge and Memorial Drive extends from the Lincoln Memorial at the north-east corner of zone 6A to the Kennedy Memorial at the south-west corner of zone 6A, or 1800 meters west and 900 meters south, for a slope of 2/1, producing an angle of 26.565 degrees south of due west. At the south-western end of Memorial drive is the Monument for Women in Military Service. Extended to the south-west from Washington Circle, New Hampshire Avenue intersects the center of the Monument for Women in Military Service at the south-western end of Memorial Drive. Washington D.C. and many of it's buildings and monuments are laid out according to the cardinal directions with the streets running due NS and EW. 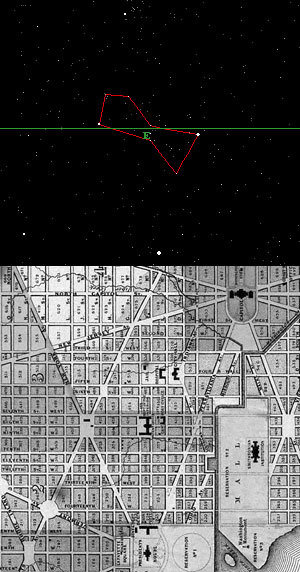 In the map of Washington D.C. below, due east is up and the star chart shows the constellation of Orion rising due east over Washington D.C., as it has done every day for the past two hundred years. Orion's belt points towards Sirius, the brightest star in the sky, and while Orion is rising and low on the eastern horizon, Orion's belt is vertical, pointing to Sirius below. In the diagram, Sirius is the bright star below Orion near the upper edge of the map of Washington D.C. The bright star above Orion is Aldebran, the alpha star in the constellation of Taurus. The axis of the ancient Egyptian temple of Isis at Dendera was oriented to the rising point of Sirius on the eastern horizon. 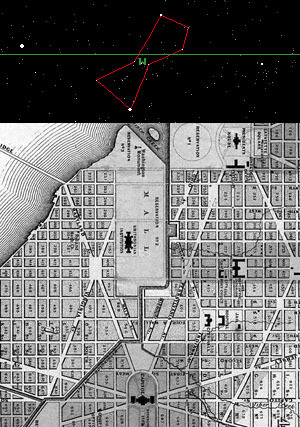 The angle of Pennsylvania Avenue from the White House to the Capitol building has pointed to the rising point of Sirius at the latitude of Washington D.C. since the avenue was laid out over 200 years ago. Looking southeast down Pennsylvania Avenue, Sirius rises directly over the Capitol building. Higher in the sky, Orion is also above Sirius and above the Capitol building from the viewpoint of Pennsylvania Avenue as Sirius rises over the horizon. The diagram above also shows the sun below the horizon on the left side of the diagram. In relation to the fixed stars, the sun rises later each day due to the rotation of the earth around the sun. The sun rises just after Sirius at the latitude of Washington D.C. on August 15. This is known as the heliacal rising of Sirius. Prior to this time of year, the sun is above or too close to the horizon for the rising of the star to be visible. Ancient Egyptians based their calendar on the heliacal rising of Sirius, which signaled the onset of the annual flooding of the Nile. Christians celebrate the Assumption of the Virgin Mary on August 15, linking the Assumption to the first appearance of Sirius/Isis in the sky just before dawn. 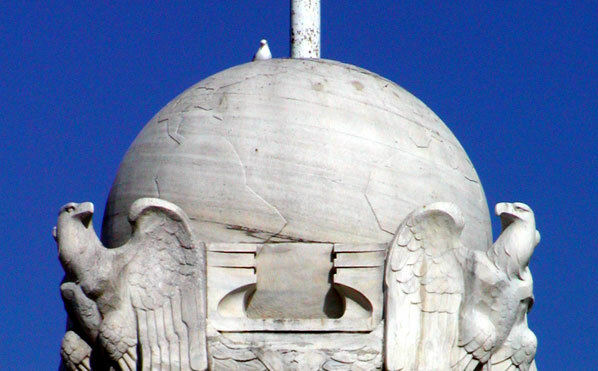 The star spangled headdress on the statue on top of the Capitol dome suggests a stellar symbolism consistent with the alignment of Pennsylvania Avenue targeting the rising point of Sirius above the Capitol building. The picture below is a close up of the statue while it was down for restorations in 1993. Orion has also set due west at the latitude of Washington D.C. for the past two hundred years. From the viewpoint of the Capitol building, Orion sets right behind the Washington Monument. Setting in the west, Orion's belt is horizontal, pointing to Sirius setting south of due west. From the viewpoint of the Capitol building, Sirius sets over the Potomac River, on the alignment of Maryland Avenue. 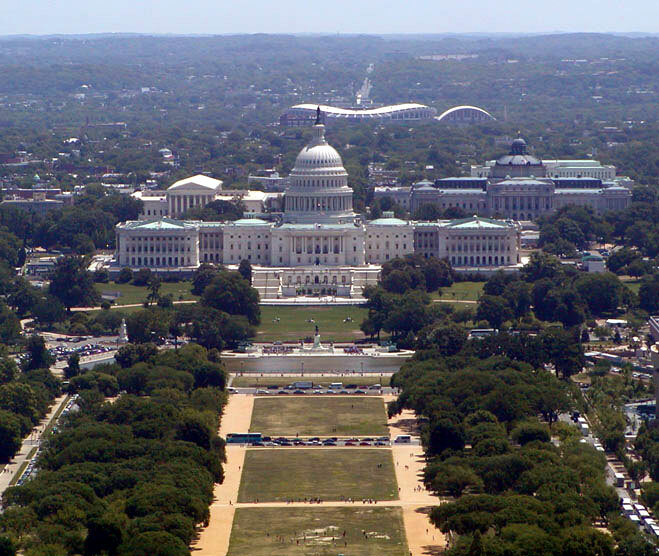 From the viewpoint of the Capitol building, Aldebran sets over the White House, on the alignment of Pennsylvania Avenue. While France and England debated whether the prime meridian should run through London or Paris, Thomas Jefferson argued that the prime meridian should run through Washington D.C., specifically through the north-south axis of the White House. The Jefferson memorial is on this same axis to the south of the White House. The Masonic House of the Temple and Meridian Park are on this same axis to the north of the White House. The Lincoln Memorial is due west of the Capitol and the Jefferson Memorial is due south of the White House. The distance from the White House to the east-west axis of the Capitol is the same as the distance from the Jefferson Memorial to the east-west axis of the Capitol. The distance from the Lincoln Memorial to the Capitol is twice the distance from the White House to the Jefferson Memorial. The distance from the Capitol to the north-south axis of the White House is twice the distance from the Lincoln Memorial to the north-south axis of the White House. 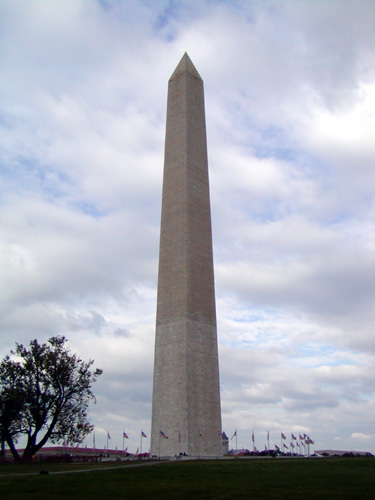 Originally, the Washington Monument was intended to be built at the intersection of the east-west axis of the Capitol and the north-south axis of the White House, but when construction started, it was determined that the ground in that location was too unstable to support the weight of the monument and the location was moved slightly to the east. View of the monument from the southwest, facing northeast. View from the base of the western face of the monument. 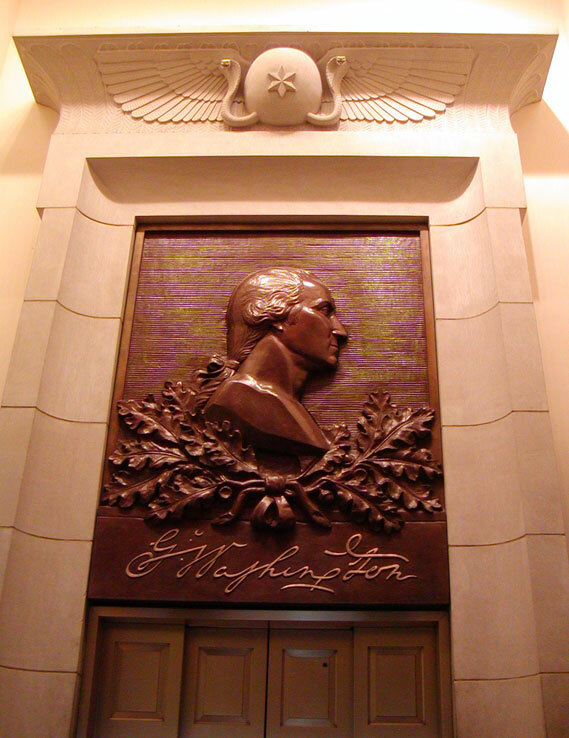 Inside the monument a bas relief of Washington is above the elevator. Above Washington is a relief of an ancient Egyptian winged disc. 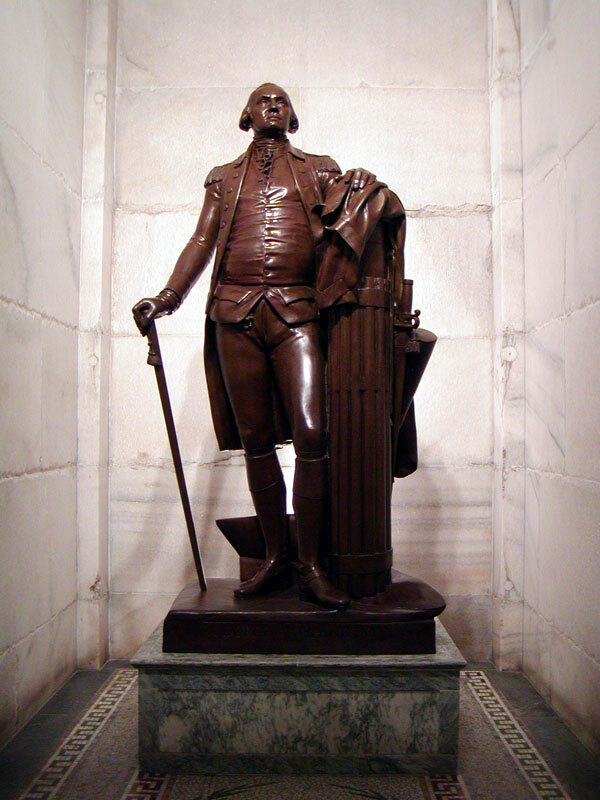 This statue of Washington is across from the elevator. Viewing windows at the top of the monument face each of the cardinal directions. Eastern view of the Capitol. 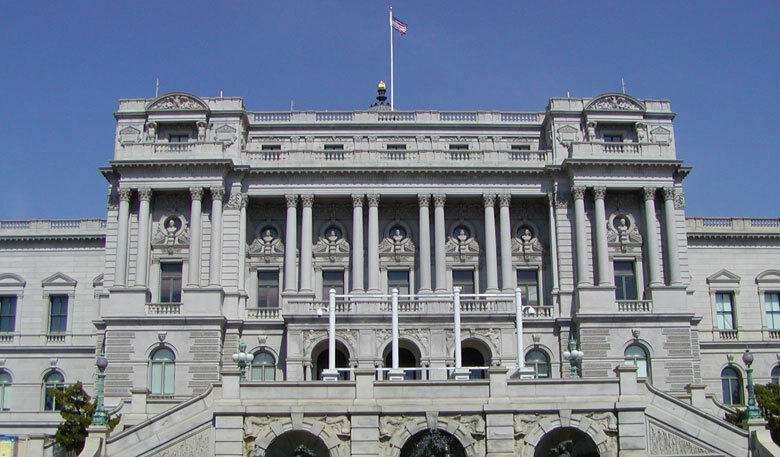 The Library of Congress is behind the Capitol to the right. The Supreme Court building is behind the Capitol to the left. Western view of the Lincoln Memorial in the background and the new World War II memorial in the foreground. Southern View of the Jefferson Memorial. Northern View of the White House (Ellipse in the foreground). The sides of the monument are aligned with the cardinal directions. At ground level the sides are 55.5 feet (666 inches) long and the monument is 555.5 feet high. The 10 to one ratio between the sidelength and the height was modeled after ancient Egyptian obelisks that have this same ratio. 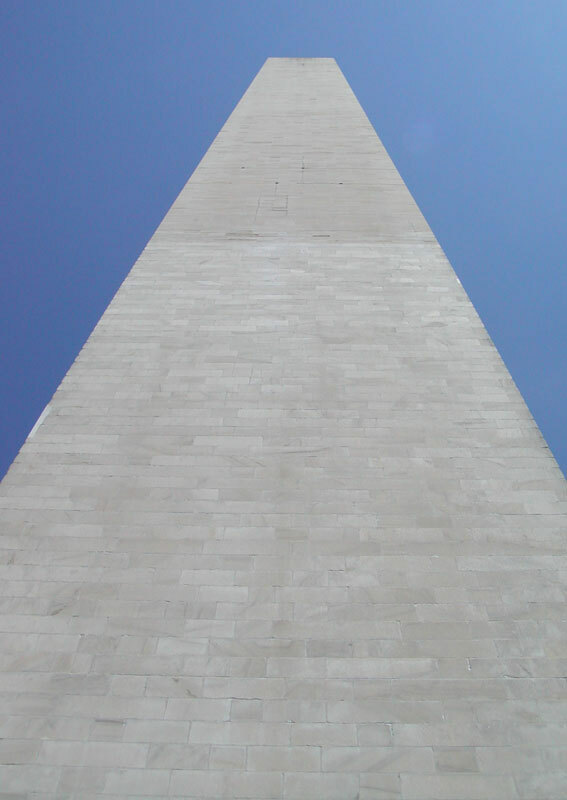 The 555.5 foot height of the monument converts to 6666 inches. 323.6 divided by φ (1.618) equals 200. The height of the monument is equal to 200 ancient Egyptian cubits times φ. The height of the monument is equal to 300 ancient Egyptian feet times φ. 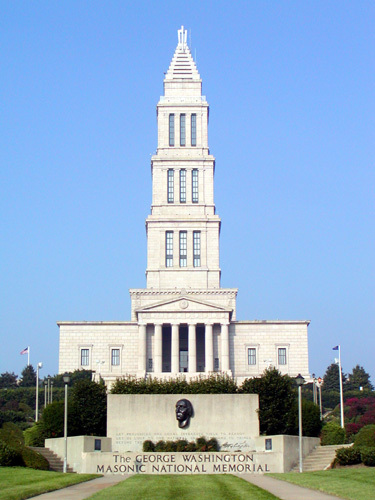 The George Washington Masonic Memorial was modeled after descriptions of the Egyptian lighthouse in ancient Alexandria, one of the seven wonders of the ancient world. The memorial is across the Potomac in Alexandria, Virginia, just inside the border of the diagonal square that originally marked the territory of Washington D.C. The memorial is at the western end of King Street. To the east, King Street ends at the Potomac. King Street is the main street of Alexandria. The EW street one block south of King Street is Prince Street. The EW street two blocks south of King street is Duke street. The EW street one block north of King Street is Queen Street. The EW street two blocks north of King Street is Princess Street. 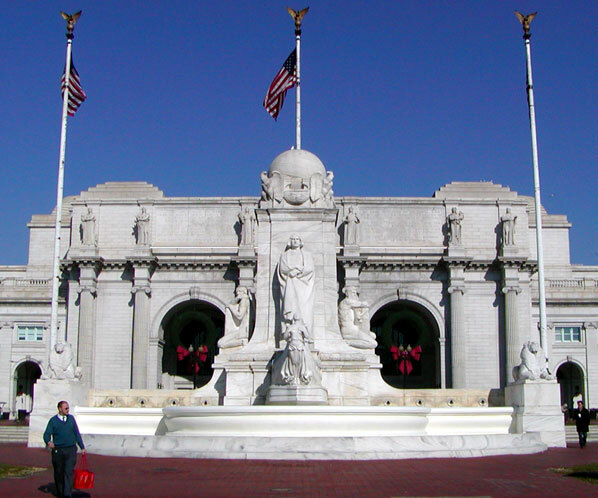 There is an Amtrak station and a metro rail station that crosses King Street just east of the memorial. This picture was taken from the platform of the metro station, facing west.. 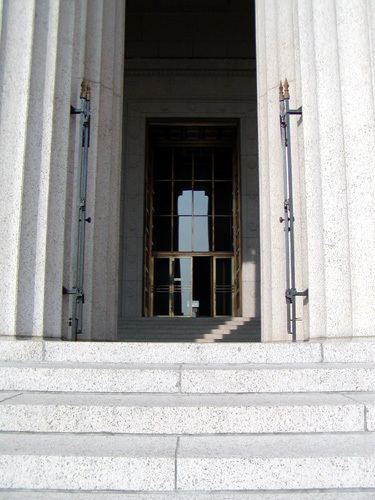 This Picture was taken from just outside the front columns, showing the glass doors and the glass windows in the front entrance of the memorial. The picture above and the next three below were taken just after 9:00 a.m. on October 11, 2003. The sun is slightly south of center, casting sunlight slightly north of center. This picture is taken from just inside the glass doors, again pointing west (Washington is looking east). 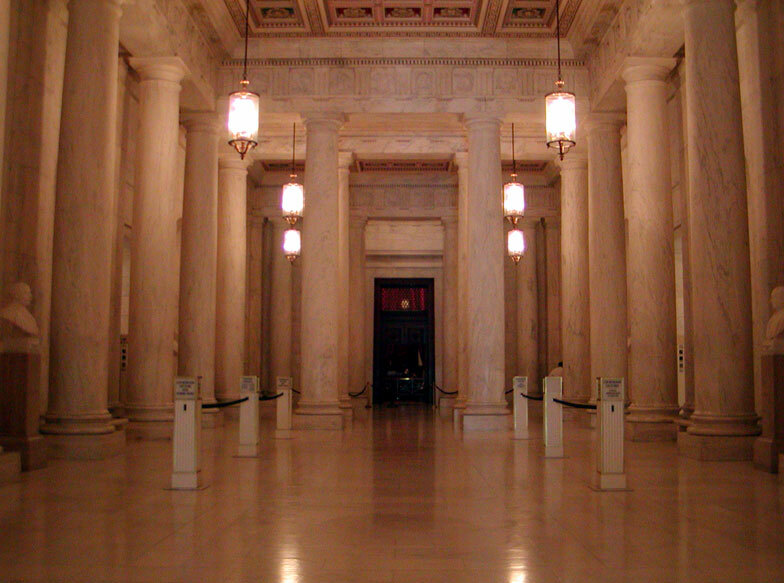 The statue is at the back of a columned hall that is centered behind the front doors and windows. Direct sunlight is striking one of the columns on the north side of the hall. On the spring and fall equinoxes the sun shines directly on the statue. 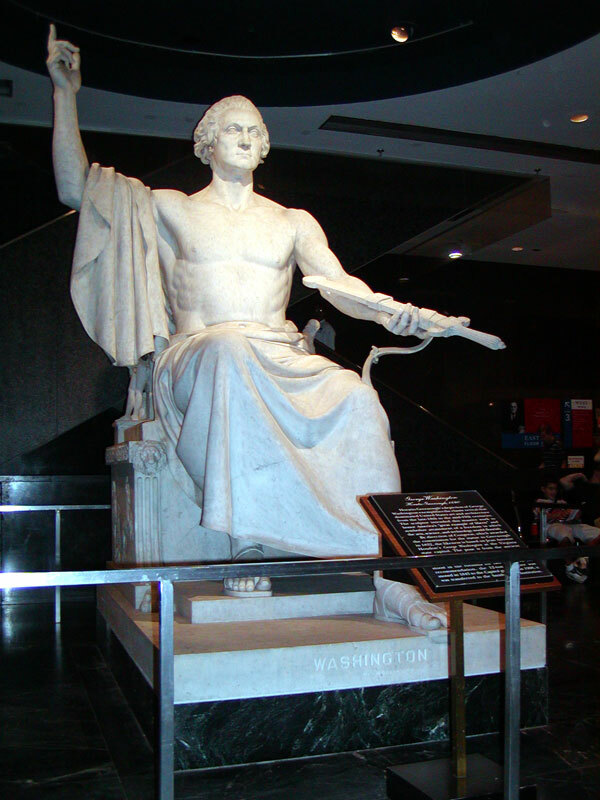 This statue of Washington in the Smithsonian Museum of American History was modeled after descriptions of the statue of Zeus at Olympia., one of the seven wonders of the ancient world. This museum is aligned to the cardinal directions. 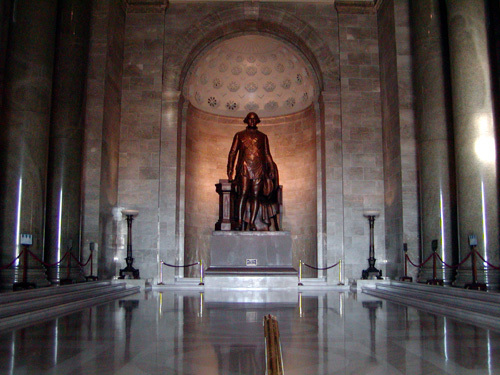 The statue is at the western end of the main floor. 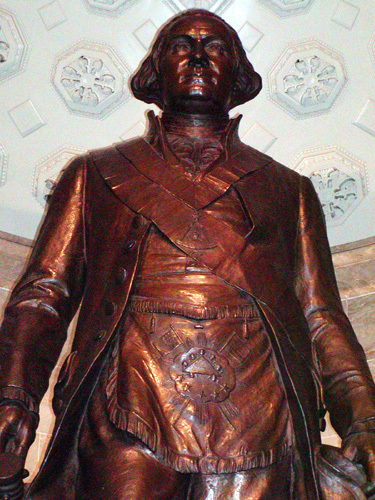 Like the statue of Washington in the masonic memorial, this statue faces east. Apollo was the favorite son of Zeus. Apollo was also known as the God of Light, Helios, the Lawgiver and the God of Prophesy. The panel below is on the left side on the statue above (Zeus/Washington's right side). Helios/Apollo is driving his chariot across the sky, carrying the sun on it's daily circuit. The Colossus of Rhodes, another one of the seven wonders of the ancient world, was styled after Apollo. 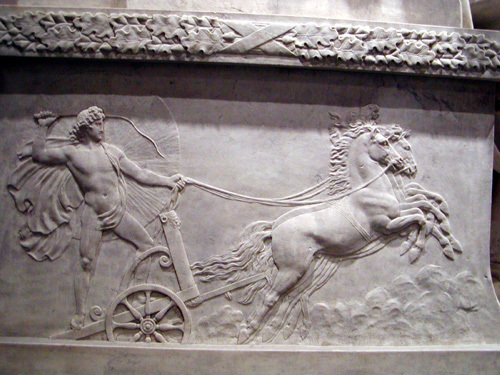 In ancient Rhodes a chariot and four horses were driven into the water each year in tribute to Helios/Apollo. Hercules was another son of Zeus. Hera was a sister and wife of Zeus. 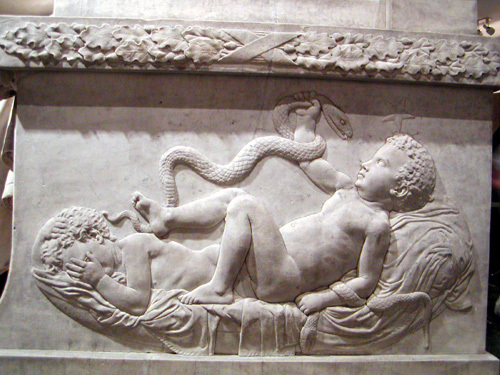 When Hera learned that Zeus had fathered Hercules by a mortal woman, she became so enraged that she put snakes in his crib, but baby Hercules strangled the snakes with his bare hands. In the panel below (on the northern side of the statue of Zeus/Washington), Hercules is shown with a star over his head, sharing the crib with his twin brother Iphicles. In the northern constellation of Hercules, the star Alpha Hercules is a double star. The two stars of Alpha Hercules are very close to each other, orbiting around a shared center of gravity. Washington Circle marks the western point of the pentagram in the street plan to the north of the White House. 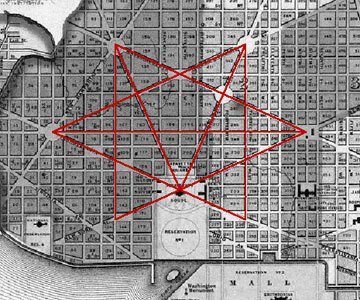 The Washington City Museum marks the eastern point of the pentagram in the street plan north of the White House. The Convention Center is across the street to the north of the City Museum. The picture above was taken from the pylon of the Convention Center pictured below. 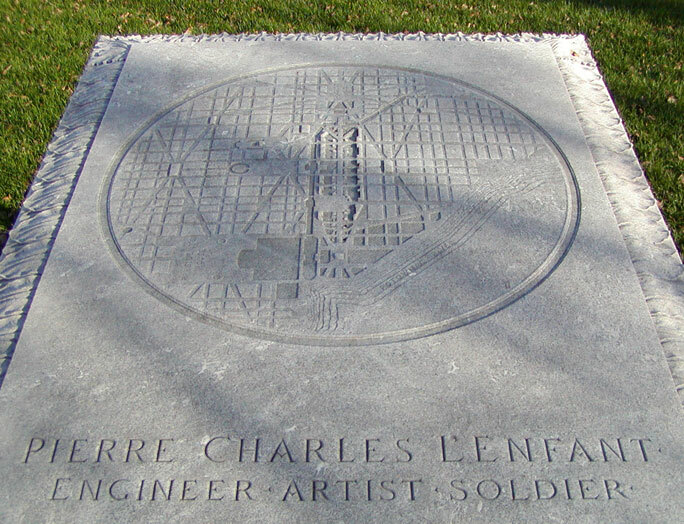 Logan Circle marks the north eastern point of the pentagram in the street plan to the north of the White House. 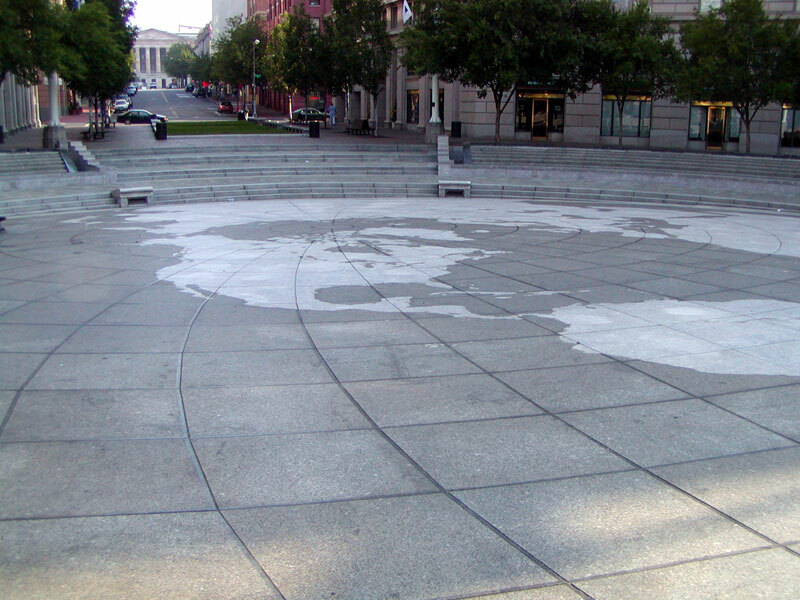 Dupont Circle marks the northwestern point of the pentagram in the street plan to the north of the White House. 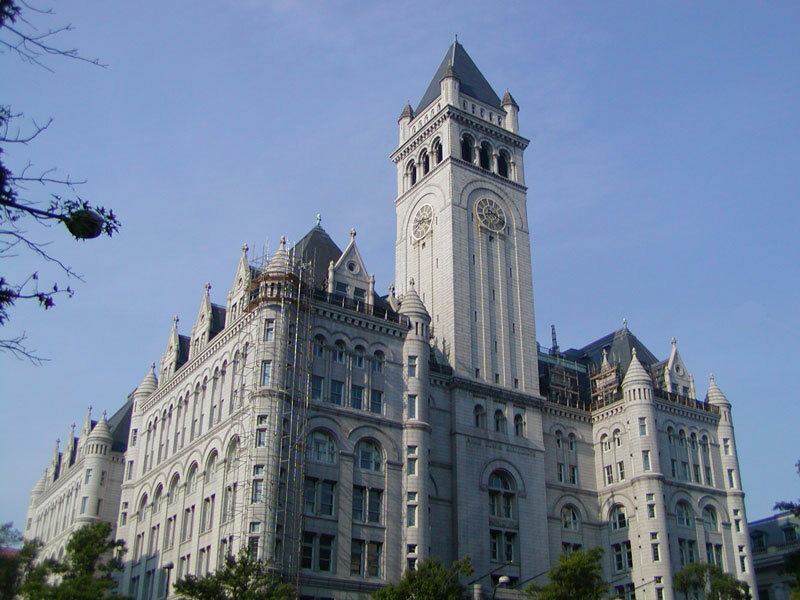 The Old Post Office is between the Capitol and the White House on Pennsylvania Avenue. After the Washington Monument, the clock tower is the second tallest structure iu the city. 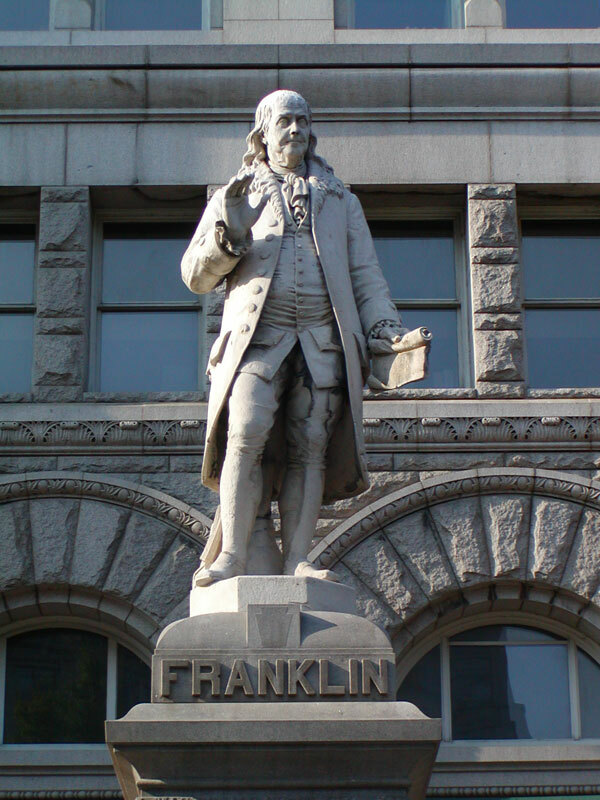 This statue of Ben Franklin is near the northwest corner of the Old Post Office. 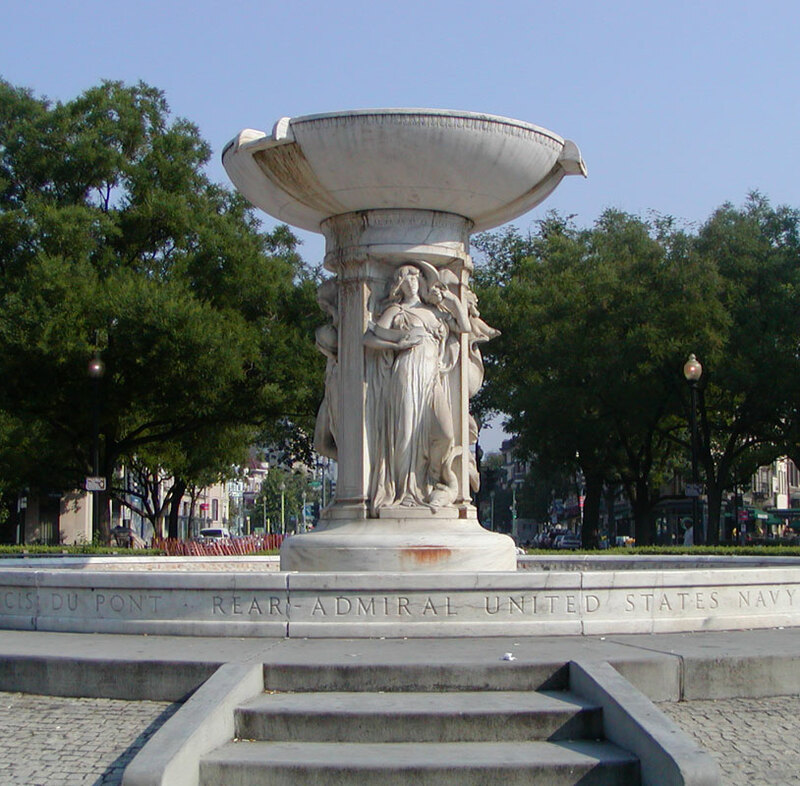 The U.S. Navy Memorial is between the Capitol and the White House on Pennsylvania Avenue. The National Archives building is across Pennsylvania Avenue (upper right in picture above). The edges of the paving stones mark the earth's meridians of longitude and parallels of latitude. 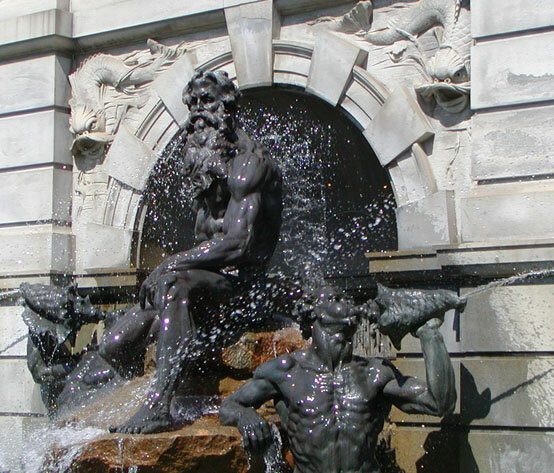 A sculpture of Neptune is in front of the Library of Congress. 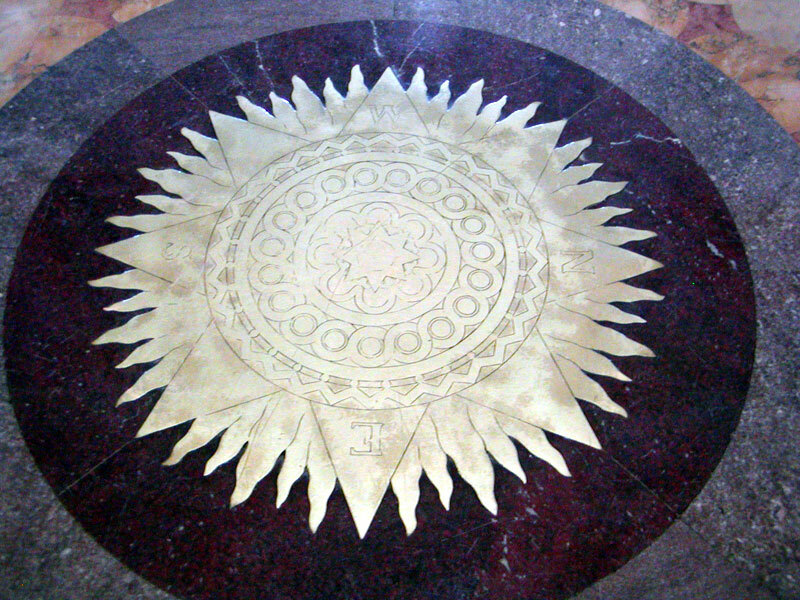 A large disc inside the front door marks the alignment of the building with the cardinal directions. 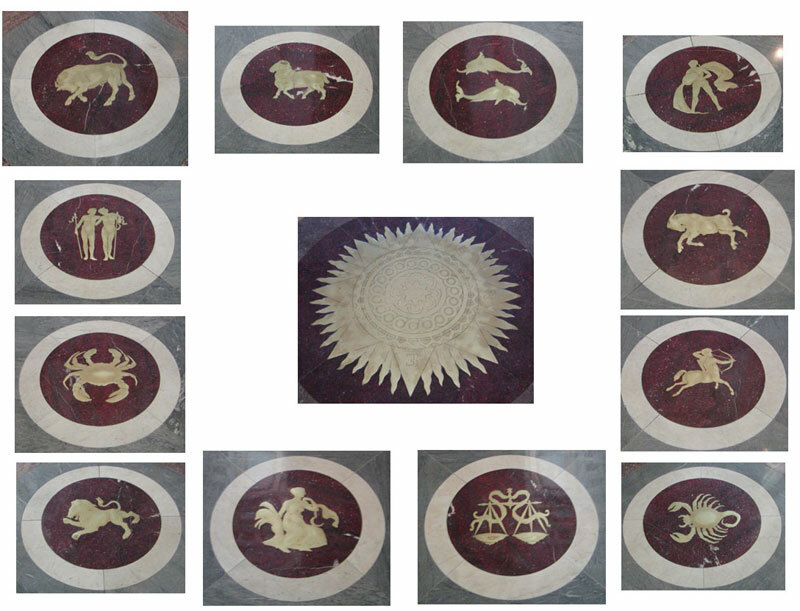 Surrounding the disc are the signs of the zodiac. 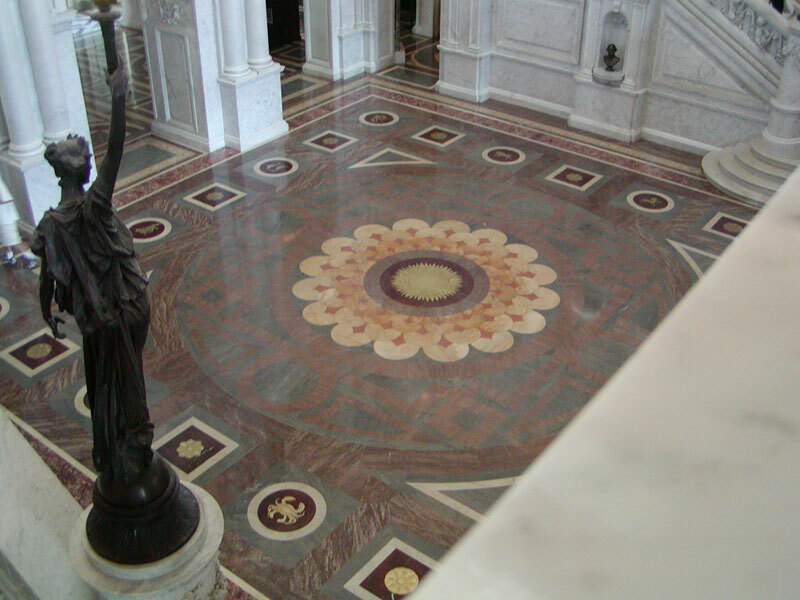 Mosaics, frescos and sculptures cover many of the floors, ceilings and walls. 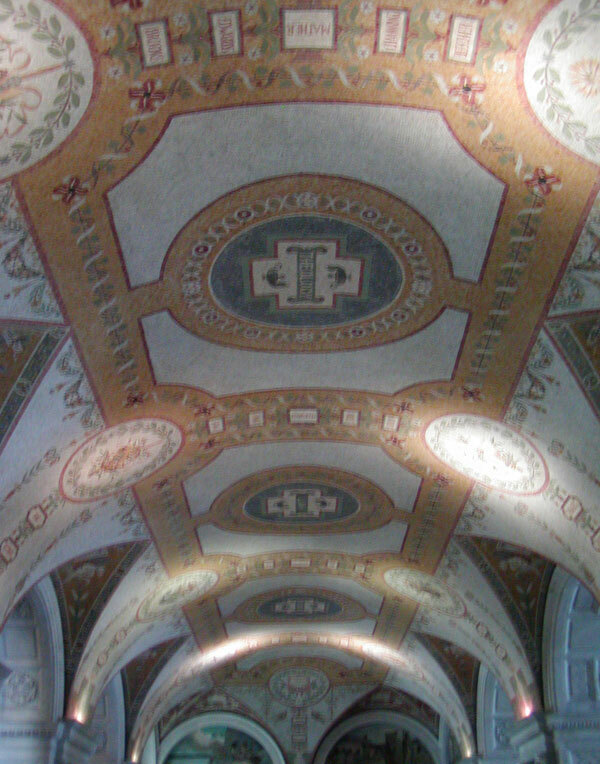 Five circles run down the center of the ceiling, with four circles on either side. Below is a diagram of the 13 circles in the ceiling. From one end of the room, the circles marked in green and blue on the diagram form a tree of life. The circles marked in green and yellow on the diagram form a tree of life from the other end of the room. 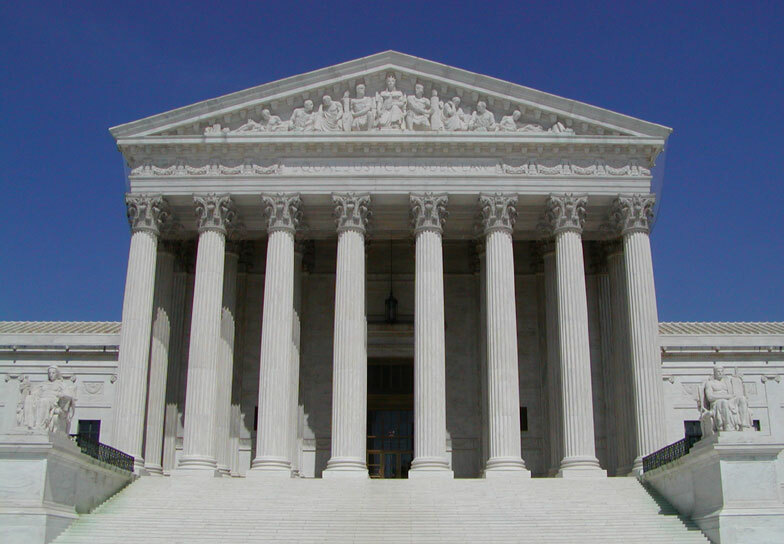 The Supreme Court building is east of the Capitol and north of the Library of Congress. The central part of the building is modeled after reconstructions of the Temple of Artemis, one of the seven wonders of the ancient world. 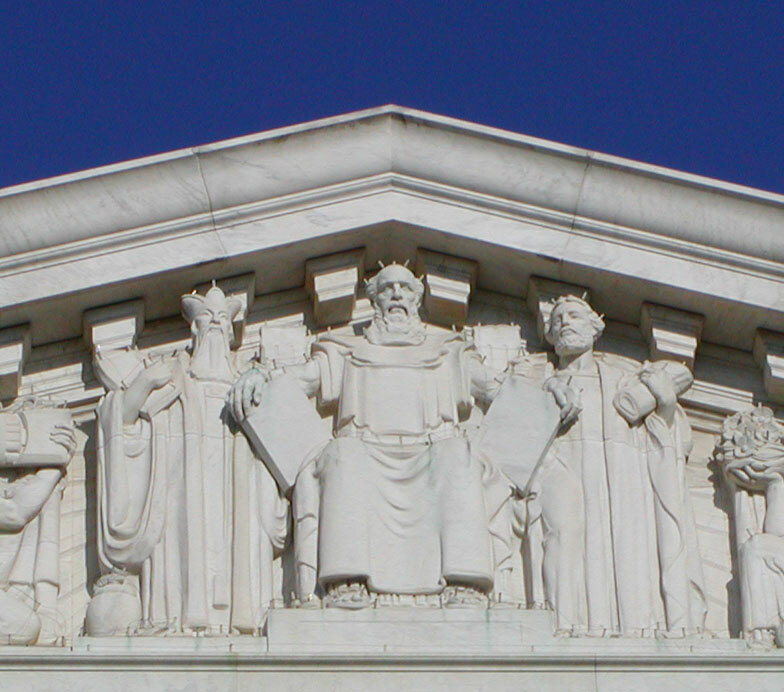 Moses is in the center of the pediment on the back (east side) of the building. Solon is on the right and Confucius is on the left. 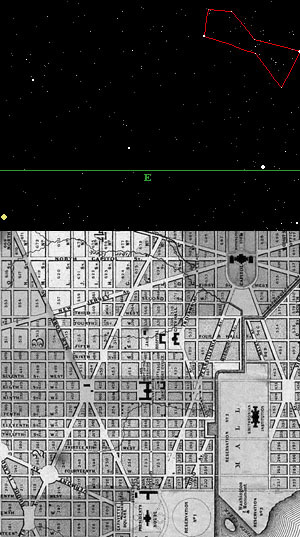 Union Station is due east of the White House (directly above the White House near the top of the diagram on L'enfant's gravestone) at the intersection of Massachusetts Avenue (the diagonal line going up from left to right on the far left side) and Delaware Avenue (the diagonal line that crosses over the Capitol going up from right to left near the top). 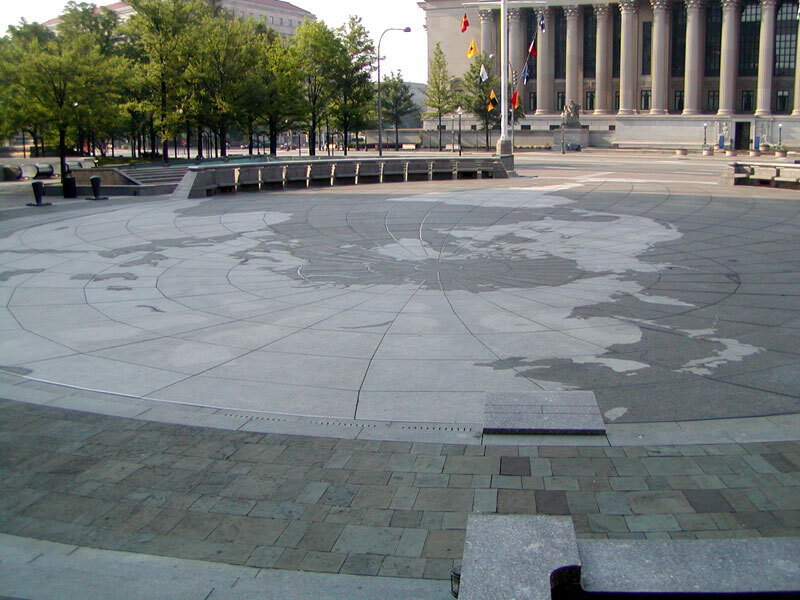 Atop the Columbus Monument in front of Union Station is a sculpture of the earth. The dove in the picture is sitting on southeastern Alaska, near the top of the globe. The horizontal circumference of the globe approximates the prehistoric alignment of world wonders. James Garfield, the 20th president of the United States, was also a high ranking mason and taught ancient languages and literature at Hiram College. Garfield was assassinated in 1881, less than a year after taking office. 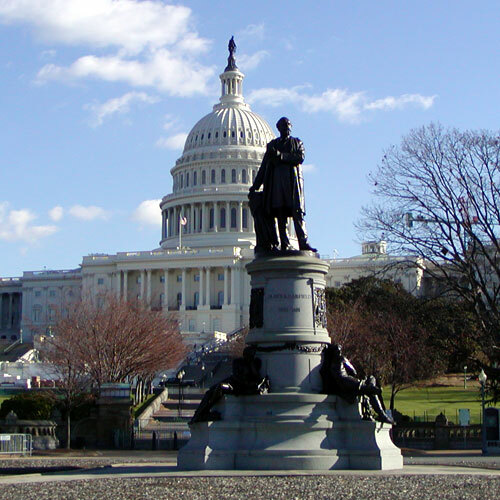 In 1887 his memorial statue was built southwest of the Capitol on Maryland Avenue. 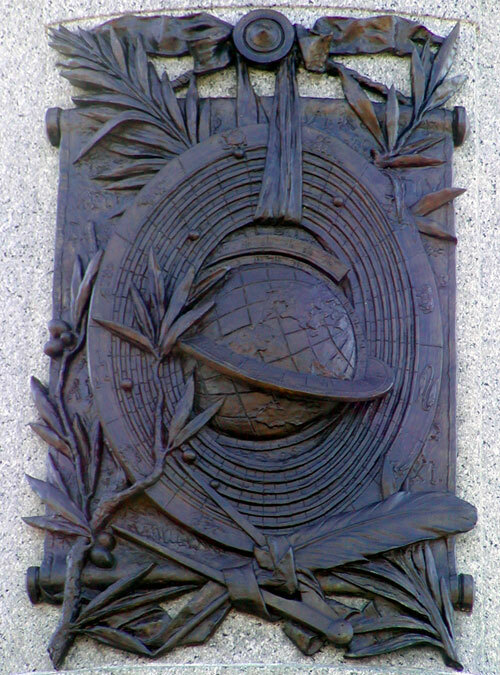 One of the plaques on the base of the monument is a bas relief of the earth, surrounded by the planets on orbital tracks and the signs of the zodiac. The earth is tilted in such a way that the southeastern coast of Alaska is several degrees to the right of the top of the globe, but the horizon ring that crosses the earth is also tilted downward from left to right. Although neither the coastlines or meridians are particularly accurate, the horizon ring is perpendicular to the southeastern coast of Alaska, closely approximating the prehistoric alignment of world wonders as it crosses over the equatorial Atlantic coastline of South America and the northeastern coast of Africa near the Great Pyramid. 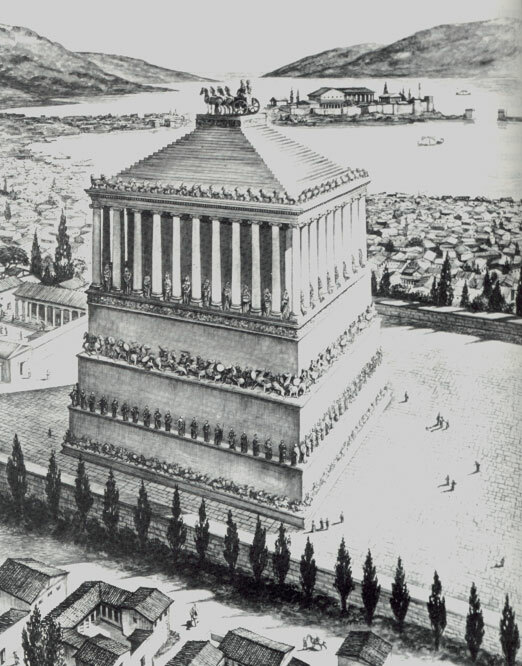 of the Mausoleum of Halicarnassus, one of the seven wonders of the ancient world. 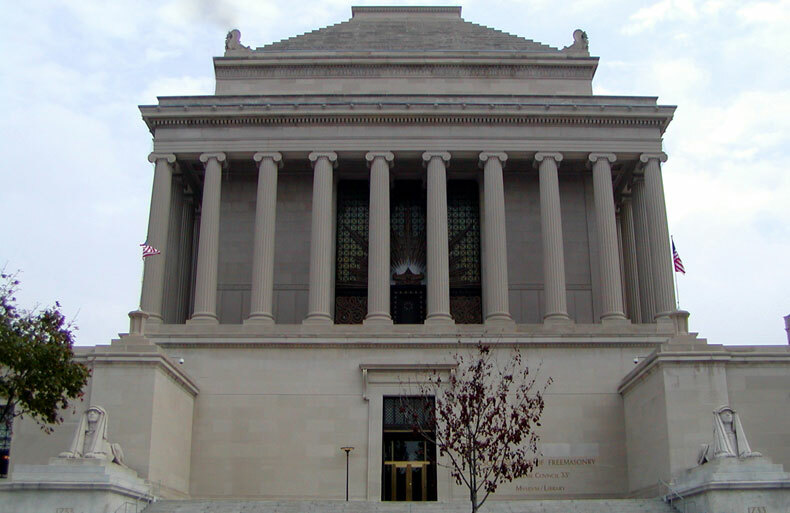 The masonic temple faces west at 1733 16th Street, thirteen blocks north of the White House. 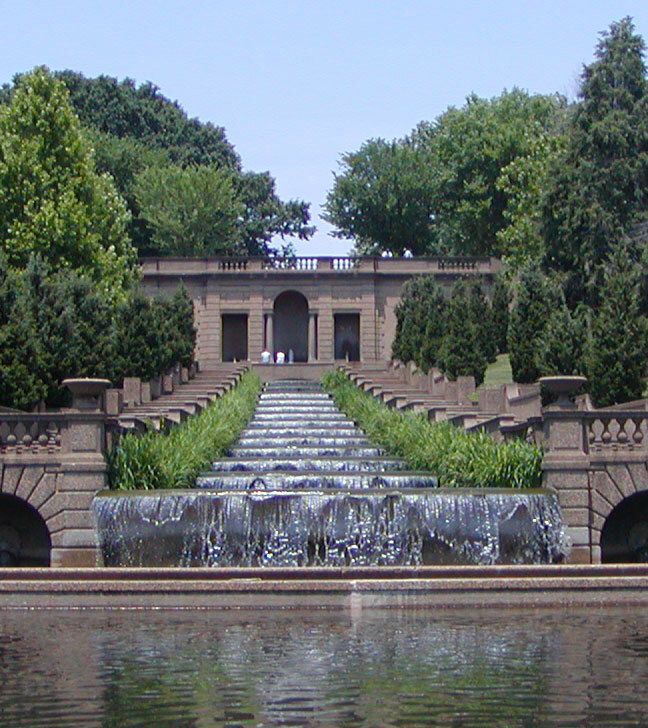 Meridian Park is located on 16th Street in Washington DC, on the same north-south axis as the Jefferson Memorial, the Washington Monument, the White House and The Masonic House of the Temple. 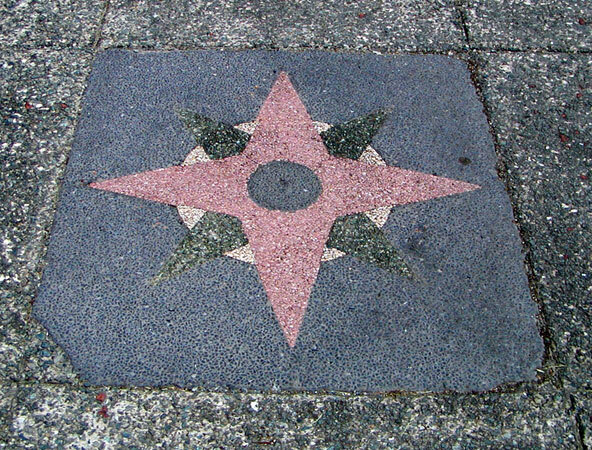 Mosaic paving stones at the entrance to the park are in the shape of compass roses. This waterfall is also aligned on the north-south axis, going down from north to south. 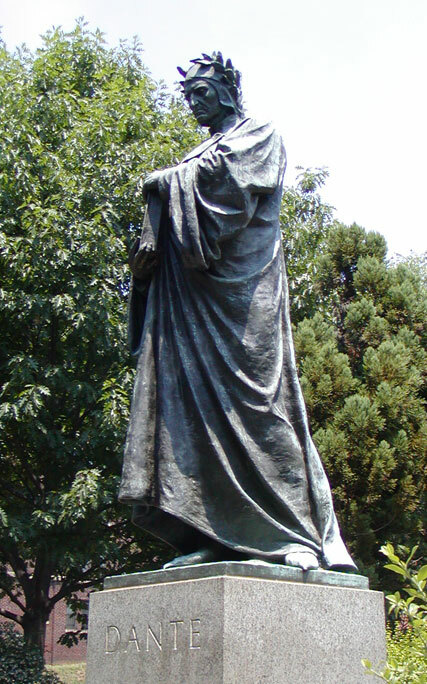 This statue of Dante is to the east (right) of the waterfall. This statue of Joan of Arc is above the waterfall. 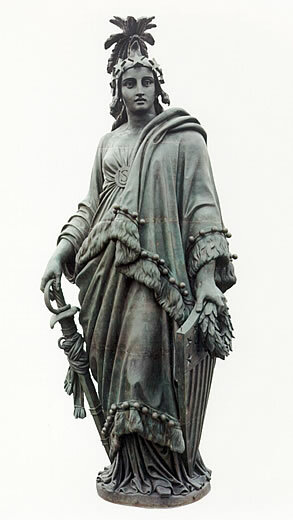 The Statue of Freedom above the Capitol dome wears a laurel of five pointed stars and holds a sword and shield. 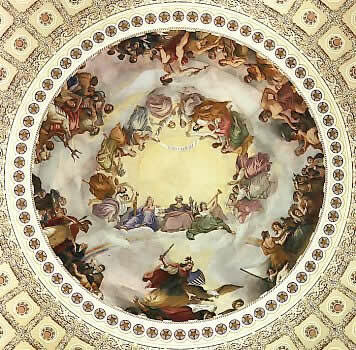 The Apotheosis of Washington by Constantino Brumidi is 180 feet above the floor of the rotunda in the eye of the Capital dome. 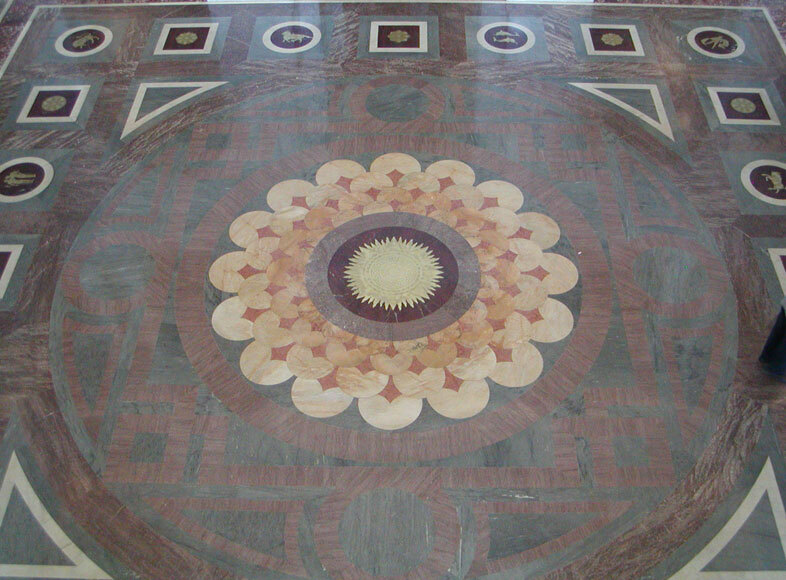 The fresco is 65 feet in diameter and surrounded by 72 five pointed stars. 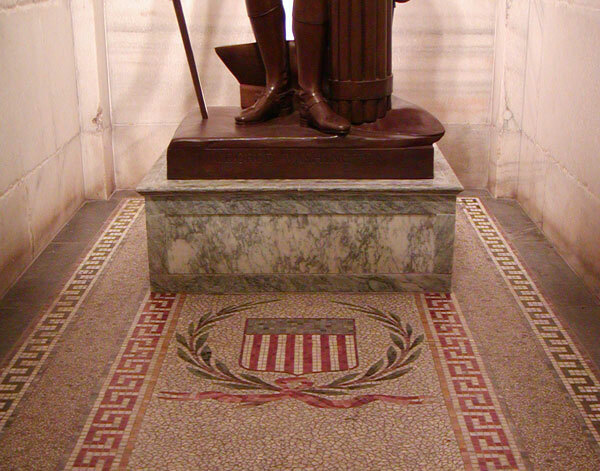 The figure below Washington is Freedom with sword and shield raised. Liberty and Fame are sitting on the rainbow and clouds next to Washington as he rises to the heavens. 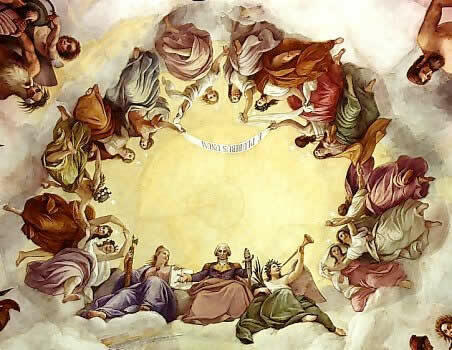 13 maidens, representing the original 13 states, complete the central portion of the fresco. The fresco has six scenes around the edge surrounding a seventh scene in the middle. 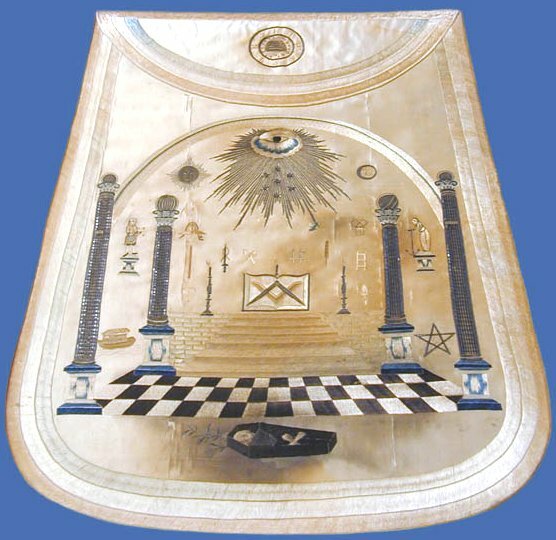 George Washington's masonic apron has six stars surrounding a seventh star in the middle. The apron has a rainbow/arch and Washington is sitting on a rainbow in the fresco. Five pointed stars surround the fresco and a five pointed star is prominent on the apron. The central feature of the apron is the mason's compass. 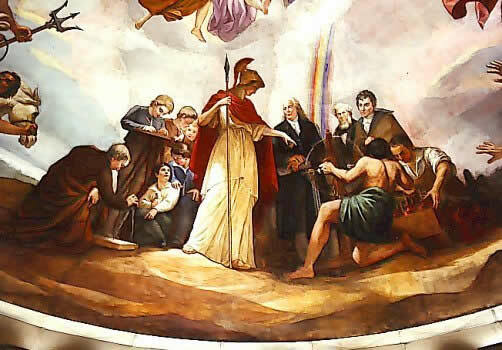 The science teacher holds a compass in the fresco. Patriae Pater by Rembrandt Peale is in the old Senate chamber. Jupiter is above Washington at the top of the frame. 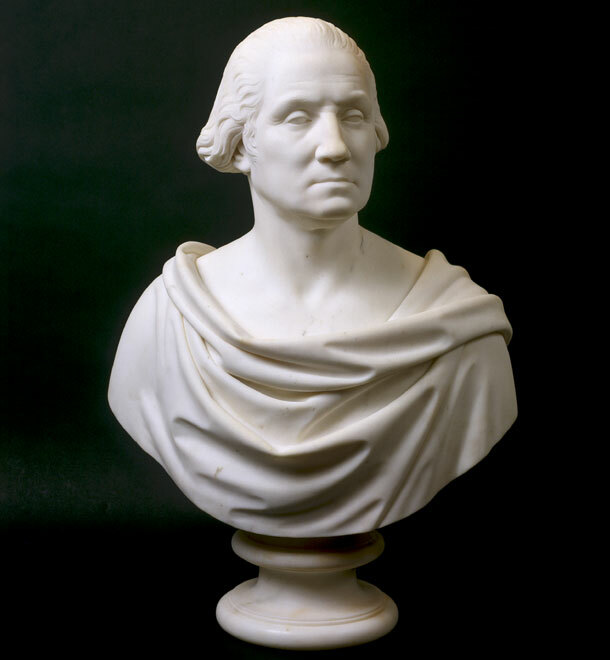 This early 19th century bust of Washington by an unknown artist was placed in the Capitol in 1966. 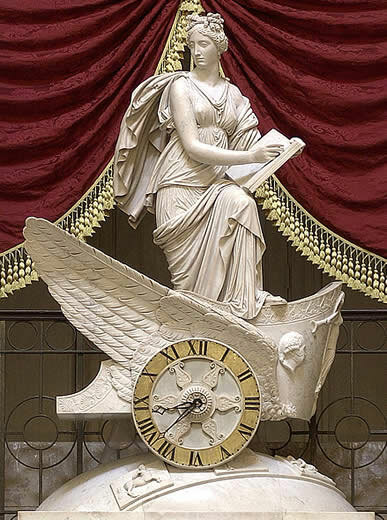 Justice, at the back of the old Supreme Court chamber in the Capitol, is flanked by an eagle and Fame as a youth. The Car of History is above the north entrance in the national statuary hall. This sculpture and Justice are both works by Carlo Franzoni. A bas-relief of Washington in profile is on the side of the car. The face of the clock is the wheel of the car, suggesting movement through time. 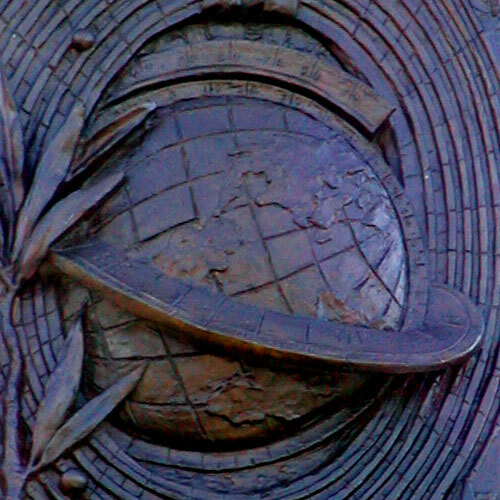 Signs of the zodiac are carved on the globe at the base of the sculpture and the wheel is on the zodiac, suggesting movement over periods of astronomical time. 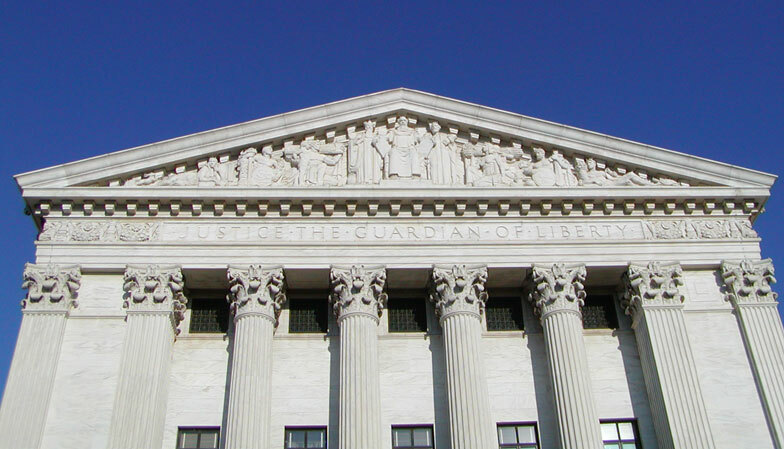 Justice and History is above the Senate doors on the east front of the Capitol. A five pointed star is engraved on the globe between the two figures. 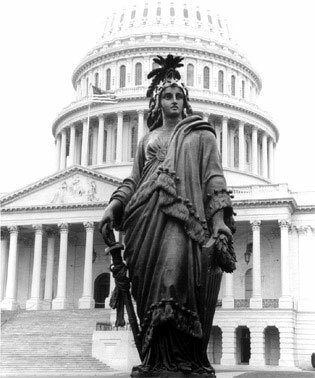 This sculpture and The Statue of Freedom are both works by Thomas Crawford. The original commission was for Liberty and Justice, but Crawford substituted History for Liberty. 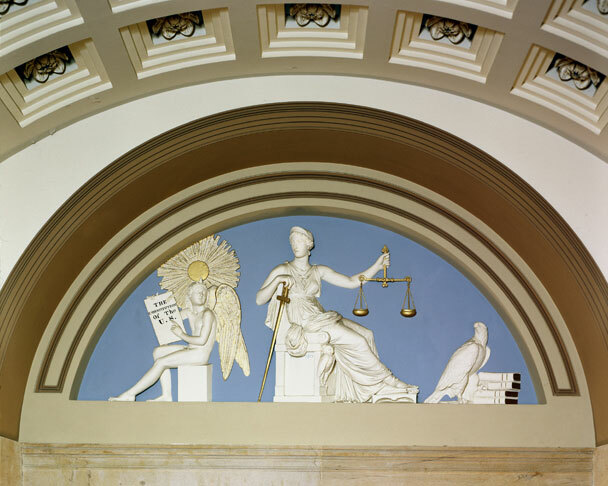 An unusual feature of this sculpture and the panel in the old Supreme Court chamber is that Justice is not blindfolded. 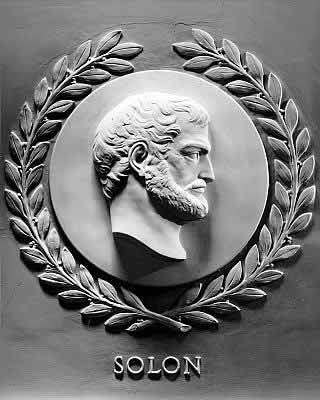 Solon is in the House of Representatives chamber where 23 marble relief portraits depict noted lawgivers. The display is centered on Moses. Solon is the first relief to the right of Moses. Plato cited Solon as his source of information about Atlantis. 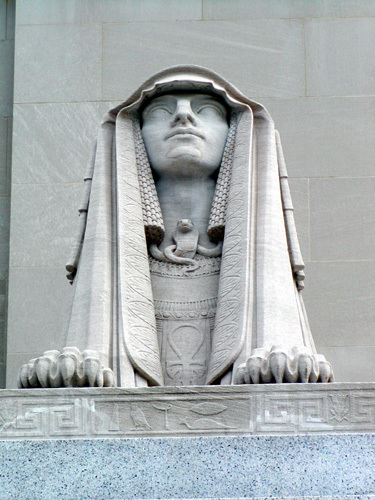 According to Solon, the story of Atlantis had been preserved and then given to him by the priesthood of ancient Egypt. Paul Devereux. Leys / "Ley Lines"
Please be informed that we are specialist and making Masonic Aprons, Regalia Badges, Flags & pennat, caps, insignias, and accessories of all cermonial / BDU uniforms. We want to work with your company if you are agree. We can send you our samples Free of cost to examine our quality work. We will provide you atractive prices than others, If you take some interest with us. Kindly comments, so that we can take next step to you.